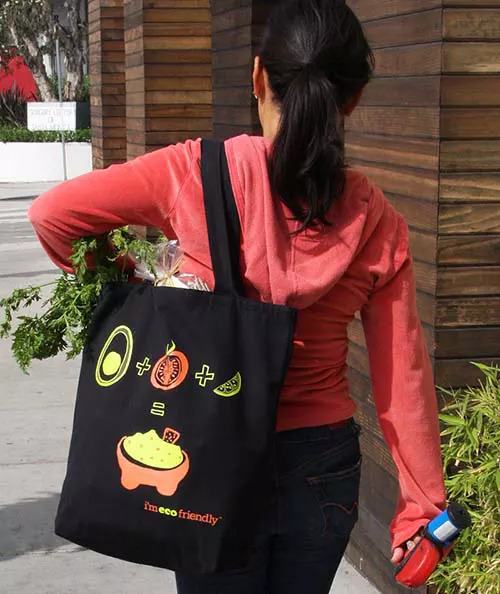 Marketing with a custom reusable bag is a smart choice for your brand and the planet. Since they are designed to be used again and again, reusable bags are constantly reminding consumers about your brand, or introducing your brand to people for the first time while also reducing plastic pollution. Reusable bags are environmentally friendly because they do away with the need and use of disposable plastic bags. When a reusable bag is made from recycled or sustainable materials it is even more eco-friendly. A major decision when it comes to creating a custom reusable bag is how to choose the fabric to use to create your one-of-a-kind bag. All of the fabrics we offer are durable and dependable and are designed and certified to withstand a heavy load, so you can rest assured that your custom reusable bag will deliver reliable results. To see how our custom reusable bags preformed when put to the test check this out. Keep reading to learn more about the fabric we offer and how to choose the right fabric for your custom reusable bag. When it comes to recycled fabrics, we offer nonwoven polypropylene, woven polypropylene and rpet. All of these materials are made using recycled plastics. The difference between these fabrics is whether they are made using post-industrial recycled plastic content (like nonwoven polypropylene) or post-consumer recycled plastic content (like rpet). Recycled plastic based fabrics are water-resistant, which is a handy feature for shopping bags or lunch bags, since they can contain small spills to a degree. The smooth surface of recycled plastic based fabrics is great for full-color printing. If you envision a reusable bag that has detailed printing, or printing that includes imagery, or even printing on all surfaces, you need to consider nonwoven or woven polypropylene or rpet. Cotton and jute canvas are both plant based fabrics, which are also known as sustainable. Plant based fabrics are eco-friendly because as living plants they convert carbon dioxide, which is a greenhouse gas, into breathable oxygen. After the fibers are harvested they are woven into fabric, but this fabric is biodegradable. Under the right conditions the compounds that make up the fabric can safely break apart and be reabsorbed into soil or used as compost. Canvas material has a more textured surface, which lends the fabric a more natural look. Some materials perform specific tasks better than others, so when selecting the fabric for your custom reusable bag consider the style of your bag. For instance, fabric made from recycled plastic is perfect for insulated cooler bags while jute or cotton canvas bags are better suited to tote style bags. Play to the strength of the material to ensure your custom reusable bag functions the way your customers need and expect it to. If price point is a determining factor you’ll want to steer more towards woven and non woven polypropylene, which tend to be more budget friendly. We have explored the difference between woven and non woven polypropylene bags for your convenience. For a full rundown of the fabrics we have available head here. If a specific style of bag catches your eye you can request a quote firstly from that product’s page, or if you have questions about how to choose the right fabric, or any part of the process you can get in touch with us and one of our team members will follow up with you.